When you work in a particular technology area it is often useful to understand who else is working on the same technologies and who may be patenting or inventing aspects of the technology. A patent landscape is the name given to a study of who holds these patents and the detailed understanding of trends in terms of numbers of patents granted; regions where the most patents are filed; understanding prior art and where potential gaps are for working on improvements or new features. In addition, links between assignees and inventors (in particular any evidence of universities or research centres working with companies) can be very useful for finding collaborators or third parties who may be interested in joint research and development. There are many organisations that provide this sort of information for a price and will provide a nice visual overview but when you are not really sure exactly what you are looking for it is much better to try out a few searches yourself and explore the landscape so that you know what you are up against and how complicated the landscape might be. Let’s now try and get a quick overview of the Internet of Things. This is a really exciting new technology area where everyday items can connect via the internet to one another and interact in useful ways. Click on search and the results immediately show. 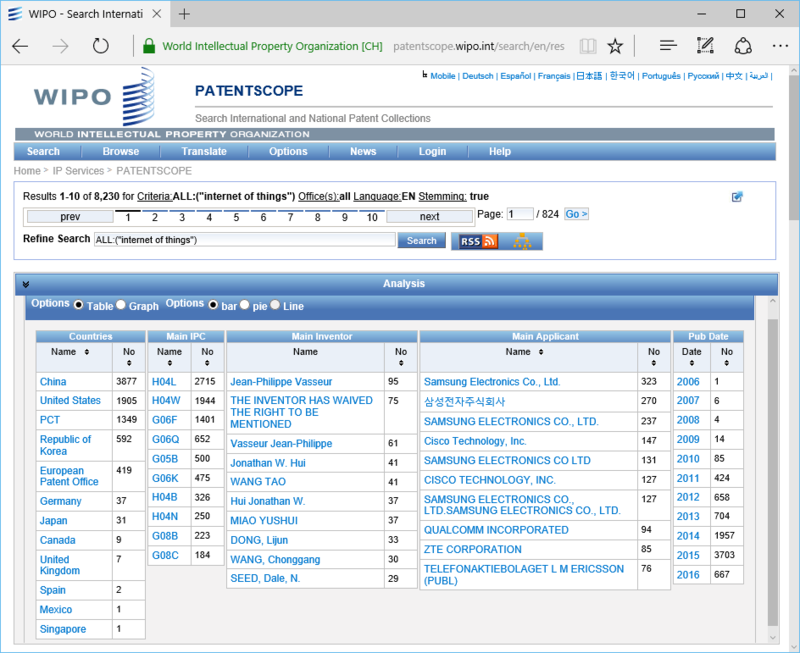 The items in the table are all clickable so you can drill down to examine patents from any of the inventors or companies very quickly, or you could examine who first started filing in 2010. One problem with the data is that it is not standardised, for example you can see that Samsung appears under different names in the table so that you would need to add these together to get a proper feel for how many of the patent documents are owned by Samsung. If you do this you find it is over 700, nearly 10% of the total. Across all the patents you can see that the last 2 years accounts for around 75% of the total number. If you wanted to explore the data in more detail you are allowed to download the results into an excel spreadsheet (10,000 records is the limit), however, you need to be logged in with a free account to be able to do this. From the spreadsheet you can unravel a lot more detail about other companies and inventors filing, start to explore trends over time and look at granted patents. In this dataset for example there are only 2.5% of the US patents actually granted, clear evidence that this is an emerging technology and there is quite a race to get the technology protected by patent rights. I hope this brief overview has given you some idea of how to get a quick insight into the patent landscape of a particular technology area. As always, do contact me if you have any questions or want a detailed landscape of your own technology area. I was recently exploring the patent search capabilities of www.Boliven.com and thought I’d share the results of a quick review of recent patents including the phrase “printed electronics”. Simply typing the term “printed electronics” (including the quotes) into the search box returns over 3400 results. These include patents and applications from US, Europe, Japan, Korea and the PCT filings. To quickly get to just the patents you can use the analyze function and the top chart is an overview of the patents granted by year. Clicking on the yellow sector of the pie chart takes you to the summary list of granted patents. This list can be further refined by selecting only patents published in 2011 from the left hand filter options. This reduces your list to the 57 patents granted this year. The results are sorted by relevance and the third one in the list caught my eye and the brief summary showing where the term “printed electronics” appears in the text is reproduced below. I found the ease with which you can scroll down the results and quickly get a feel for the most relevant patents highly valuable. You can access the full text of any patent and follow up on the detail. The full result set can be exported or saved to a list for sharing with colleagues or for working on later. 1. A process for creating electrical circuits or circuit elements using imaged gravure printing plates, the process comprising: obtaining a gravure printing plate imaged by etching a substantially flat plate; mounting the imaged gravure printing plate to a printing apparatus, wherein the imaged gravure printing plate comprises an image configured to create an electrical circuit or circuit element with features of 10 microns or less, and wherein the printing apparatus comprises a cylinder, and a carriage adapted to be moved into contact with the cylinder, wherein a substrate to be printed is mounted to one of either the cylinder or the carriage, and the imaged gravure printing plate is mounted to the other of the cylinder or the carriage; applying a material to be deposited on the substrate to the imaged gravure printing plate wherein the material is present in the etched areas of the imaged gravure printing plate; directly contacting the substrate with the imaged gravure printing plate to transfer the material from the imaged gravure printing plate to the substrate; and removing the substrate from contact with the imaged gravure printing plate, wherein the material forms a first patterned layer of an electrical circuit or circuit element on the substrate corresponding to the image of the imaged gravure printing plate. 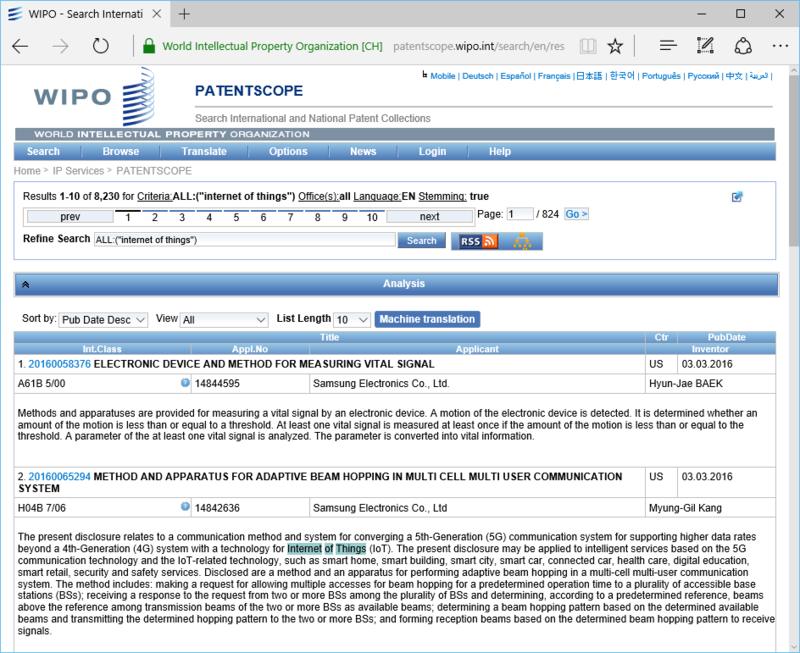 Hopefully this has given you a brief insight into how easily the modern patent search tools can help you find relevant prior art or competitors’ patents to inform your own business or technology strategy. Of course if you wanted to do a thorough analysis you would need to construct a much more comprehensive search term and use a combination of keywords and patent codes to be sure of identifying all the relevant material in the databases. Post a comment if you want any more details on fine tuning this type of search.